The Relative Strength Index (RSI) was devised to determine the best time to make a trading decision. You want to make that decision at the change of direction only by ensuring that the average up move is greater than the average down move over a certain number of days (or the other way around for a sell signal). In other words, the average momentum is relatively higher (or lower), hence the name relative strength. The RSI is much faster than momentum in signaling an impending price change, making RSI a good tool for timing profit-taking, especially if you are using a short-term version. However, the RSI falls short in the reliability department when it comes to buy/sell signals. For that reason, traders use RSI more often as a confirming indicator, while they use other indicators to obtain the buy/sell signal. In this figure, the RSI is shown in the top window, with two momentum indicators in the second window (a raw momentum indicator and a smoothed one containing more days), and the price chart itself in the main window. The gray trendlines are included just for orientation. On the left of the chart, while the price is rising, the RSI and momentum rise, too. RSI, however, hits and surpasses the 70-percent limit and starts turning down the very next day after the highest close. Momentum also turns down, but doesn’t cross the center sell line for another two weeks. The RSI then falls to the bottom of its range at an index reading of 30 percent. Overbought: When the RSI is at or over the 70-percent level, the security is considered overbought. An overbought condition is when the security has moved so far and so fast that traders want to take profit. You can automatically sell when the security becomes overbought (when it crosses the 70-percent line), or you can use the line as a confirming indicator with other indicators. 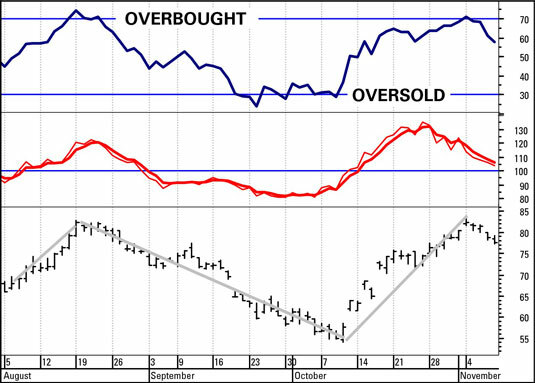 Oversold: When RSI hits the 30-percent level, the security is considered oversold. A security is oversold when everyone who was going to sell has already sold, and the security is now relatively cheap (inviting buyers back in). When trends are strong, securities can remain overbought or oversold for long periods. However, a divergence between the price and the indicator is a warning sign that the price move may be coming to an end. In the preceding figure, for example, the RSI serves as a sell signal at the overbought level but doesn’t provide an equally clear buy signal when it first meets the oversold level. Instead of reversing smartly, the RSI indicator meanders down around the oversold line for several weeks. So, on one occasion it’s a buy/sell signal, and on the next occasion, it’s a warning.